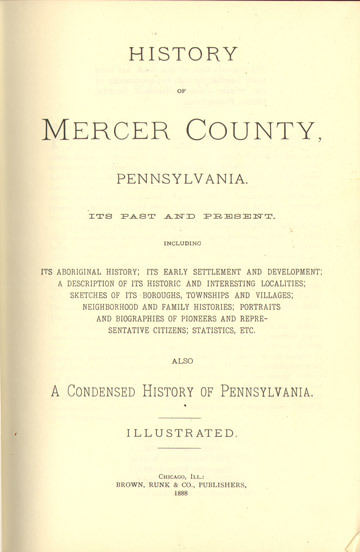 Originally published in 1888 by Brown, Runk & Co., this is a 1981 reprint by Unigraphic, Inc.
A detailed history of Mercer County, Pennsylvania. Also included are biographies of many individuals and families. Volume 1 is entirely history, 650 pages. Volume 2 is entirely biographies, 560 pages. Volume 3 is a modern, expanded index, 168 pages. Hardbound, three volumes, 1210 pages plus 168 page index.